GO-PED scooters have been around since 1985 and are the original in petrol motorised scooters they are the original company to bring the petrol scooter to the world. this is where the whole craze started not only do they do petrol scooters they also porvide electric scooters, go-karts, off road karts. all the GO-PED scooters, karts, off road karts are made from high grade aircraft aluminium so are of the highest quality. and every engine has been tried and tested since 1985 and are of the highest quality. dont confuse this scooter with any other scooter available which come from china and are not even close in comparison to GO-PED. and remember this is where the whole petrol scooter started in california in america since 1985. and here at www.muckandfun.com we offer only the best in big boys toys. below is all of what GO-PED have to offer and all at unbeatable prices. and with thousands of upgrades available there is no limit to what any GO-PED can do. CLICK ABOVE TO GO TO OUR NEW 50 MPH + PETROL / ELECTRIC SCOOTERS evo powerboards ! the world's BEST in Portable Transportation Products again raises the bar of its own high standard of quality and innovative design with the new 2008 GoPed ESR750H Hoverboard ®. This electric scooter is based on the highly regarded, time tested and award winning GoPed ESR750EX , but incorporating the amazing Cantilevered Independent Dynamic Linkless Indespension (C.I.D.L.I.) suspension system featured on our highly successful off road products such as the championship winning GoPed Trail Ripper, TRQ and GoPed Riot mini motorcycle. Utilizing 3 major patents, this two wheeled marvel will quietly, efficiently and effortlessly propel riders of up to 400 lbs above the ground with the sensation as if they were magnetically levitating on a cloud. The degradation of urban streets, rough nature of country roads and everything in-between are practically un-noticeable as you float over them on this energy saving scooter. The ESR750H Hoverboard ® offers 2.7" of suspension travel in the front and 3.5" of suspension travel in the rear that is adjustable from "plush to firm" for customizing the perfect balance to suit rider preferences. Very effective and stylish front and rear fenders help protect both rider and Hoverboard ® in the event in foul weather and the Mad Dog front disc brake with anti dive produces secure and reliable stoping power. As with all ESR 750 GoPed scooters it requires nothing more than the included charging cord and a power outlet anywhere in the world to recharge your scooter.regardless of where you may find yourself. The Flux-Capacitor ® throttle/energy monitor will give a full disclosure on your charge status taking the guesswork out of cross town trips. The ESR750EX is equipped with sealed lead acid batteries. The ESR750EX will provide users with an impressive 8 mile range in Economy mode - a top speed of 12 mph - and up to a 5 mile range in Turbo Mode, which allows users to reach a top speed of 20mph*.At only 59.5 pounds, the ESR750EX has an excellent range to weight ratio over all other SLA models in its class.It is ideal for Electric enthusiasts and commuters looking for an economical electric scooter which boasts unmatched power, reliability, and performance. Incorporating the same quality standards with high quality materials, components, and American craftsmanship as our top of the line ESR750H insures you that this is the best sealed lead acid battery powered scooter available. Chain Drive Operation with Auto-Adjusting Chain Tensioner - Power from the DC electric motor is transferred to the rear wheel through an extremely efficient and easy to maintain chain drive system. Chain adjustments cannot get any easier as the auto-adjusting chain tensioner does the job for you. Dual Performance Modes - The operator can chose the "Econo" or "Turbo" performance mode on the throttle control to either go "twice as far, half as fast", or "twice as fast, half as far", providing users with absolute control over their choice of speed and range. Economy has up to an 8 mile range while Turbo Mode gets 5 miles. On Board Charger - The ESR750EX has a very efficient on board "Smart Charger" to quickly, safely and fully recharge batteries using a separate charging chord to any 110v or 220v household power outlet worldwide. The original California Go-Ped ® has been in production for the past 25 years and the model that push started the powered scooter industry. The extremely rugged and sturdy Sport model has only been refined over the years and was designed to create a simple, economical, portable, and fuel-efficient form of personal transportation. With a simple direct drive transmission that improves the power delivery to the rear wheel helps keep moving parts, size, and weight of the Sport to a minimum while increasing the efficiency makes the versatility of the Sport appeal to commuters and fun lovers of all ages. With over 25 years of being in production there is a seemingly endless combinations of aftermarket parts available for the person that loves to tinker. Operation is easy with the simple push start capability, just push and Go, stop and fold the bars for carry and you can take the Sport with you anywhere. Dimensions L-34" W-13" H-42", Folded L-34" W-13" H-14"
Additional Features *The original "Goped" with a huge selection of aftermarket parts. *Extremely Efficient drive system with only one moving part. *Converts to a standard kick scooter by disengaging the drive. *Lightest weight and compact design. The larger air filled tires on the GSR Cruiser make navigating through bumps and chuckholes a snap and the perfect machine for the customer wanting a quiet, reliable and economical motorized scooter with excellent performance, but also for the beginners wanting an affordable, safe and easy to learn first powered scooter. The GSR Cruiser is also the perfect machine for motor heads, tinkers, and the after market community, as chassis upgrades and screaming engine mods are widely available for a seemingly endless combination of customizability. The fuel efficient, powerful and quiet GPL290 engine provides a smooth yet thrilling acceleration to reach speeds above 21 mph in its stock configuration with enough power to easily propel even the heaviest of operators. The GSR Cruiser frame is the bullet proof using very successful single sided cantilevered 4130 Chromoly GSR chassis with cantilevered 4130 fork. The popular 10 inch pneumatic TT racing tires are on ultra light race proven magnesium rims front and rear perfecting the package. Power is delivered to the rear wheel through a centrifugal clutch and chain drive for easy operation, just hop on and pull the throttle to Go. Stopping power comes from the very efficient front Mad Dog brake caliper and double ground and hardened stainless steel Wave disc rotor. The rear brake mount is ready for the optional rear brake upgrade for increased stopping power needed on highly modified machines. The folding handlebar is a sturdy 6061 T6 welded "T" bar providing unmatched handling and control so your Go-Ped will take you wherever you tell it to eXpress your freedom. The GTR Roadster seamlessly incorporates the all the benefits of the GSR Cruiser with the innovative, bullet proof, and time tested CIDLI suspension system found on the top of the line off-road GTR46R Trail Ripper to meet the consumer demands for a powered scooter with the quite yet powerful GPL290 engine for an incredibly plush ride capable of handling any bumps, cracks, and chuckholes thrown at it. This cool scooter features the race proven, patented, adjustable, and bullet proof chromyl GTR full 6" CIDLI suspension frame. To that we've installed the incredibly light, yet powerful and quieter GPL290 engine with centrifugal clutch and chain drive, and TT tires so power and performance is there to impress even the experience Go-Ped enthusiasts. The GTR Roadster also comes with the standard welded 6061 T6 T bar, and front wheel only Mad Dog disc brake which creates a lighter machine with a lower price point but just as easy to upgraded with rear brake mounts already in place. To round off this "Synister Black" machine the Interceptor style kick stand is mounted. The GTR Roadster is ideal for the person that prefers to eXpress their freedom with the advantages of full effect of 6" of CIDLI suspension with less of an impact on neighbors. The self-powered push scooter crafted for adults. Created in 1997 and inspired by the original Sport gas-powered scooter, the Know-Ped has all the design features of the Sport without the motor.Handcrafted from the same high quality aircraft grade materials that all Go-Peds are made from, the Know-Ped is strong, durable and portable. It stands out as the new standard in push scooter design and construction. After great demand from our dealers and anticipation from retail customers, we are pleased to introduce the New Super Grow-Ped . After years of being meticulously engineered at the Skunk Werks, and raved about as the C.I.D.L.I., Patmont Motor Werks, the innovators of present day motorized scooters and creators of the Go-Ped ® Brand, has just announced the release of their new pure off-road scooter, the Go-Ped ® Trail Ripper 46. No longer are paved surfaces important for Go-Ped ® use. Previously other off-brand scooters have been introduced with traditional shocks. However, weight, complexity, reliability, short 1-3" travel and rider standing room problems have prevented these types of vehicles from reaching true off-road success. Both swing arms are "cantilevered" 4130 Chromoly steel tubing and the wheel rims are made of ultra light Magnesium . 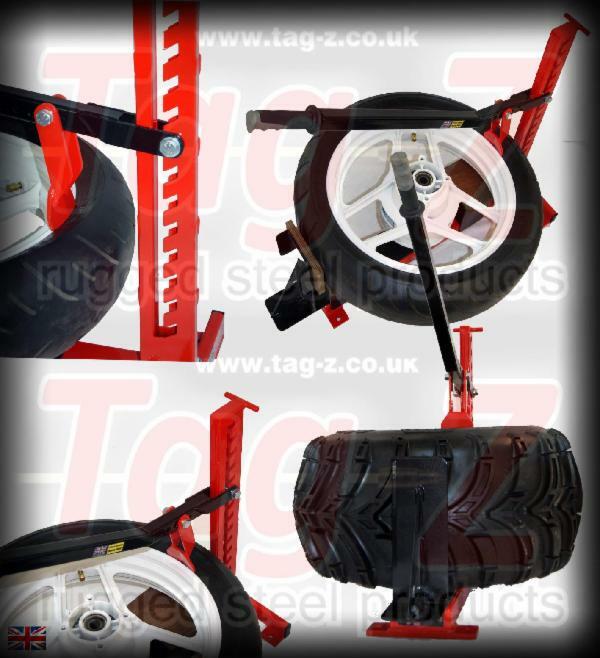 This produces very low unsuspended weight, and allows the wheels to stay in better contact with uneven ground. The result is excellent trail riding and handling characteristics. This design also greatly simplifies any maintenance issues. To accommodate various rider skills, weights, and preferences, the suspension can be tuned from "plush" to "firm" through its elastomer compression adjusters . These adjusters raise and lower its natural damping characteristics as well. The C.I.D.L.I. suspension system geometry produces very effective "anti-dive" characteristics under braking from its powerful and race proven "Mad Dog" twin stainless steel wave rotor disc brakes. For power, PMW is introducing a new 4 port, 4 HP, high compression, high RPM 45.7cc 2 stroke engine . This purpose designed engine becomes PMW's top of the line performer of its production gas powered scooter line-up. Power delivery is through a single reduction pocket bike style chain system with 78mm automatic centrifugal clutch . Though the aftermarket selection is already great, the stock sprocket ratio was chosen to deliver the best bottom end for this combination. This produces absolutely the highest fun factor in trail riding for this scooter. Chain adjustment uses PMW's patent pending adjustable motor mount system found on many of its other very successful and race proven products. Its Chromoly single tube frame, reinforced aircraft grade 6061-T6 folding handlebar system with Tim Patmont bend bars (like on the TSi) contribute to making the Go-Ped ® Trail Ripper 46 a very light weight device. Combined with its truly revolutionary C.I.D.L.I. suspension, it is not only very practical but creates a new way to have a high level of safe off road low cost FUN. Don't delay be the first in line to get your hands on the new revolutionary Go-Ped ® Trail Ripper 40. Inspired and bred from the ultra popular and best-selling Go-Ped ® Trail Ripper GTR46R, the new Go-Ped ® Riot 46 fulfills demand from pit bike riders for a premium quality, super compact and lightweight, yet low cost off-road bike. Using the patented Trail Ripper adjustable CIDLI suspension system in the front and rear, it offers riders great off-roading capabilities with 6" of travel on each end. Powered by the powerful Go-Ped ® GP460RS engine, the rugged and highly reliable Riot gives excellent bottom end and a stock top speed of 30mph. The centrifugal clutch provides for a very user friendly yet thrills-packed ride. Weighing at only 48 lbs, it has been designed to provide maximum fun in a hassle free package which can be carried just about anywhere. No trailer to tow, no truck or ramp to own Just Put a Riot in Your Ride. Inspired and bred from the ultra popular and best-selling Go-Ped ® Trail Ripper GTR46R, as well as the original Go-Ped ® Riot The Go-Ped RIOT 29 fulfills demand from pit bike riders for a premium quality, super compact and lightweight, yet low cost off-road bike as well as ultilitarian riders that want a quiet and less agressive ride for more populated areas. Using the patented C.I.D.L.I adjustable suspension system in the front and rear, it offers riders tremendous comfort with 6" of travel on each end. Powered by the quiet and fuel efficient GPL290 the highly reliable Riot 29 is perfect for getting around urban areas. The centrifugal clutch provides for a very user friendly ride. The Super GSR46R by Patmont Motor Werks set the benchmark of power and speed in the motorized stand-up scooter market and racing world. The Super GSR46R is the fruit of PMW's excellent experience in building scooting machines that are built exclusively for the race track. It boasts never before seen power, stunning speed and unmatched handling. Yet, it remains true to the Go-Ped signature characteristic, being light weight, weighing in at only 35lbs and made from only high quality materials and components with American hand craftsmanship. Developed on the legendary GSR40Tsi - Interceptor Go-Ped platform - the Super GSR46R is powered by the same motor as on the fearless Trail Ripper GTR46. Equipped with a patent pending centrifugal clutch chain drive mechanism, the GP460RS engine delivers 4.2HP and 2.31 ft-lbs torque with a 17,500 redline, providing for excellent performance at low and high speeds. Tunable, it can even reach 5.5+ HP and 2.6+ ft-lbs of torque with the addition of an aftermarket expansion chamber. All of Patmont Motor Werks finest racing components come standard: Heavy duty 4130 chromoly steel frame and double sided fork, pneumatic TT tires mounted on magnesium rims and 20" Motorcycle style "Tim Patmont bend" racing folding handlebars fitted with a slide tube clamp, billet stem pro clamp, Go-Ped race pad and Pro performance control levers. The SGSR46R is available in four powder coated colors: gloss black, championship orange, Ferrari red and Beach Boy blue. For the past 25 years, PMW has continued to innovate and bring to consumers the most top finishing, race proven scooters in the world. Today, the Super GSR46R gives racers the absolute power they need to leave competition at the starting line. Built for extreme competition, the Super X-Ped is an upgraded version of the former X-Ped. The new Go-Ped ® GPl290 motor puts out 2.5 horse-power and can be tuned to reach much more. Factory race team grips, double sided fork, fatty deck, and a new color were added to make this scooter the envy of those in the know. This bad boy is for competition use or for all you nut cases out there. anybody into skating bmx stunts or anything of that sort this is the perfect tool for the job. The Go-Quad 30 is without doubts set to blow away any competition. Based on the highly successful platform of the original Go-Quad, the Skunk Werks set out to improve it even more by integrating what top racers have been doing to get the extra edge on the track and by making those proven modifications standard! The most important improvement in the Go-Quad 30 was for PMW to leave the traditional one wheel drive design by going to a shifter cart inspired live rear axle, making the Go-Quad 30 two-wheel-drive and two-wheel-braking . Unlike all prior Go-Quad models, the Go-Quad 30 offers 100% of pure equal turning in both directions and puts an end to pulling towards one direction under braking. This major enhancement provides users with the most perfect handling capabilities. It gives them safe and absolute control while also achieving much faster track time. The chain driven/centrifugal clutch on the Go-Quad 30 comes standard. It is set at a slightly lower gear ratio than the previous models to provide for the best acceleration off the line and out of corners. A newly designed steering plate has been added and allows the inside cornering wheel to turn slightly sharper than the outside wheel. Often referred to as "Ackerman Steering", this new feature produces excellent responsive turning. After extensive testing by PMW "Skunk Werks" and proven performance on the track, the caster - the angle in which the front wheels tilt s back - has also been optimized to 17 degrees to reduce "pushing" and consequently offer excellent cornering. The 2 full inch added to the length of the front axle also contribute to the Go-Quad 30 excellent stability and handling performance. The handlebars have been ergonomically enhanced. Wider, lower and slightly forward, they provide for a more aggressive location. They also have a 20 degree bend for the ultimate rider's comfort, now making this the easiest Go-Quad to get into and out of. The Go-Quad 30 most definitely boasts incomparable features and performance, already celebrated before its official launch today during the first ISA Race of the Season. Over this past weekend at the ISA Scootercross ® races in Phoenix, AZ, the new Go-Quad 30 was tested in the Endurance Quad class by Tim Patmont. The Go-Quad 30 was totally out-of-the-box stock and managed to take a First place win with an amazing 167 laps in the 45 minutes straight duration! The next closest racer was lapped nine full laps by this Go-Quad! Not only did this race prove the performance and reliability of the Go-Quad 30. It also showed that the Go-Quad 30 will be the new dominant machine on the race track! 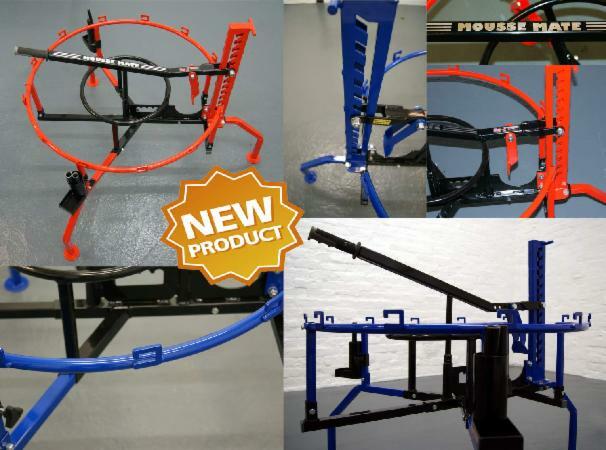 PMW is proud to extend its very successful and well proven Micro Kart line of products by the exciting addition of the Super Go-Quad 46. The Super Go-Quad 46 becomes the latest top of the line Go-Quad model and will allow users and go-karts racers to take their karting passion to professional height! Engineered using the winning Super Go-Quad 30 design, the Super Go-Quad 46 is equipped with the thrilling and powerful high output GP460RS engine and drive train. The GP460RS Go-Ped ® engine, which boasts an incredible 4 Horse Power, and the 78mm automatic centrifugal clutch allows the new Super Go-Quad 40 to keep pushing the limits of Micro Kart Racing. The Ferrari Red powder coating gives it the screaming color this unique racing machine deserves. The New Super Go-Quad 46 is equipped with a rear live axle, making it just like its little brother Super Go-Quad 30, two-wheel drive and two-wheel braking.